December 28 is the feast of the Holy Innocents. This festival commemorates King Herod’s slaughter of all the boy-children in Judea in order to ensure that promised Messiah would not pose a threat to his throne. No parent can look at his own child this day and fail to know the anguish of these parents. It is the Innocents’ parents one remembers when standing over the bed of a fevered child keeping a night’s vigil, or when reflecting on the loss of innocent children at Sandy Hook Elementary School in Newtown, Connecticut. We are called as well to pray for all the unborn children around the world, that their lives would be preserved. Just as with Our Lord and Savior, we are taught that life begins at the moment of conception. “For that which is conceived in her is of the Holy Ghost.” (Matthew 1:20). At one time this feast day was known in England as Childermas Day, and was a day of mourning when the churches ran a muffled peal of bells. During this octave of Christmas the Church celebrates the memory of the small children of the neighborhood of Bethlehem put to death by Herod. Sacrificed by a wicked monarch, these innocent lives bear witness to Christ who was persecuted from the time of His birth by a world which would not receive Him. It is Christ Himself who is at stake in this mass-murder of the children; already the choice, for or against Him, is put clearly before men. But the persecutors are powerless, for Christ came to perform a work of salvation that nothing can prevent; when He fell into the hands of His enemies at the time chosen by God it was to redeem the world by His own Blood. Our Christmas joy is tempered today by a feeling of sadness. But the Church looks principally to the glory of the children, of these innocent victims, whom she shows us in heaven following the Lamb wherever He goes. Today, dearest brethren, we celebrate the birthday of those children who were slaughtered, as the Gospel tells us, by that exceedingly cruel king, Herod. Let the earth, therefore, rejoice and the Church exult — she, the fruitful mother of so many heavenly champions and of such glorious virtues. Never, in fact, would that impious tyrant have been able to benefit these children by the sweetest kindness as much as he has done by his hatred. For as today’s feast reveals, in the measure with which malice in all its fury was poured out upon the holy children, did heaven’s blessing stream down upon them. “Blessed are you, Bethlehem in the land of Judah! You suffered the inhumanity of King Herod in the murder of your babes and thereby have become worthy to offer to the Lord a pure host of infants. In full right do we celebrate the heavenly birthday of these children whom the world caused to be born unto an eternally blessed life rather than that from their mothers’ womb, for they attained the grace of everlasting life before the enjoyment of the present. The precious death of any martyr deserves high praise because of his heroic confession; the death of these children is precious in the sight of God because of the beatitude they gained so quickly. For already at the beginning of their lives they pass on. The end of the present life is for them the beginning of glory. These then, whom Herod’s cruelty tore as sucklings from their mothers’ bosom, are justly hailed as “infant martyr flowers”; they were the Church’s first blossoms, matured by the frost of persecution during the cold winter of unbelief. For James there was no indication that this was the day that his life would change. The dawn for him was not the bright beginning of a new day, but the end of long fruitless night of fishing. As James sat mending his nets in the boat with his brother John and his father Zebedee, he must have watched in wonder as his partner Simon brought in nets loaded with fish he had caught at the command of Jesus. Was he shocked when he saw Simon and his brother Andrew walk away from this incredible catch at a word from this same Jesus? As he watched Jesus walk toward him followed by Simon and Andrew, did he feel curiosity, fear, hope, envy? Jesus didn’t pass him by but, stopping by their boat, called James and his brotherJohn to do just what Simon and Andrew had done. Without argument or discussion, James and John left their boat and even their father behind, and followed Jesus. The first thing James saw after he followed Jesus was his teaching with authority in the synagogue and the cure of Simon’s mother-in-law. We all know that Jesus was the focus of James’ life from then on, but it is also evident that James held a special place in Jesus’ life. He was chosen by Jesus to be one of the twelve apostles, given the mission to proclaim the good news, and authority to heal and cast out demons. To be named one of the twelve James must have hadfaith and commitment. But even among the apostles he held a special place. When Jesusraised Jairus’ daughter when all thought her dead, he only allowed James, John, and Peter to come with him. Even more important when he went up to the mountain to pray, he wanted James, John, and Peter to go with him. And it was there on the mountain they were privileged to witness what no one else had seen – Jesus transfigured in his glory, speaking to Moses and Elijah, as the voice of God spoke from a cloud. And with Simon Peter, James and John were the only ones of the apostles that Jesus gave a special name: Sons of Thunder. To be singled out in these ways, James must have been a close and respected friend of Jesus. It’s no wonder then that James, along with John, felt that he had the right to go to Jesus and ask him to give them whatever they asked. As a mark of his love, Jesus didn’t rebuke them but asked them what they wanted. They showed their lack of understanding of his mission when the asked that he let one of them sit on his rightand the other on his left when he came into his glory. He replied that they didn’t know what they were asking. They didn’t see the cross in his future, but an earthly throne. Could they drink of the cup he would drink of? They replied that they could. He assured them they would indeed drink of that cup. The other apostles were furious at this request. But Jesus used this opportunity to teach all of them that in order to be great one must be a servant. James and John did show further lack of understanding of their friend and Lord when he was turned away by Samaritans. They wanted to use their newfound authority as apostles not to heal but to bring fire down on the town. (Perhaps Jesus gave them their Sons of Thunder nickname because of their passion, their own fire, or their temper.) Jesus did reprimand them for their unforgiving, vengeful view of their power. But despite all these misunderstandings, it was still James, Peter, and John that Jesus chose to join him inprayer at the Garden of Gethsemane for his final prayer before his arrest. It must have hurt Jesus that the three of them fell asleep on this agonizing evening. James did drink of the cup Jesus drank of, all too shortly after the Resurrection. Acts 12:1 tells us that James was one of the first martyrs of the Church. King Herod Agrippa I killed him with a sword in an early persecution of the Church. There is a story that the man who arrested James became a convert after hearing James speak at his trial and was executed with him. James is called James the Greater because another younger apostle was named James. He should not be accused with this James, or the James who is a relative of Jesus, or the James who was an elder of the Church inJerusalem and heard Peter’s defense of baptizing Gentiles. James, son of Thunder, was dead by then. St. Paul was born at Tarsus, Cilicia, of Jewish parents who were descended from the tribe of Benjamin. He was a Roman citizen from birth. As he was “a young man” at the stoning of Stephen and “an old man” when writing to Philemon, about the year 63, he was probably born around the beginning of the Christian era. To complete his schooling, St. Paul was sent to Jerusalem, where he sat at the feet of the learned Gamaliel and was educated in the strict observance of the ancestral Law. Here he also acquired a good knowledge of exegesis and was trained in the practice of disputation. As a convinced and zealous Pharisee, he returned to Tarsus before the public life of Christ opened in Palestine. Some time after the death of Our Lord, St. Paul returned to Palestine. His profound conviction made his zeal develop to a religious fanaticism against the infant Church. 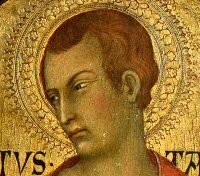 He took part in the stoning of the first martyr, St. Stephen, and in the fierce persecution of the Christians that followed. Entrusted with a formal mission from the high priest, he departed for Damascus to arrest the Christians there and bring them bound to Jerusalem. 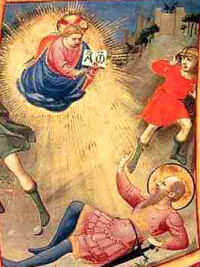 As he was nearing Damascus, about noon, a light from heaven suddenly blazed round him. Jesus with His glorified body appeared to him and addressed him, turning him away from his apparently successful career. An immediate transformation was wrought in the soul of St. Paul. He was suddenly converted to the Christian Faith. He was baptized, changed his name from Saul to Paul, and began travelling and preaching the Faith. He was martyred as an Apostle in Rome around 65 AD. The earliest certain observance of a feast in honor of all the saints is an early fourth-century commemoration of “all the martyrs.” In the early seventh century, after successive waves of invaders plundered the catacombs, Pope Boniface IV gathered up some 28 wagonloads of bones and reinterred them beneath the Pantheon, a Roman temple dedicated to all the gods. The pope rededicated the shrine as a Christian church. According to Venerable Bede, the pope intended “that the memory of all the saints might in the future be honored in the place which had formerly been dedicated to the worship not of gods but of demons” (On the Calculation of Time). But the rededication of the Pantheon, like the earlier commemoration of all the martyrs, occurred in May. Many Eastern Churches still honor all the saints in the spring, either during the Easter season or immediately after Pentecost. How the Western Church came to celebrate this feast, now recognized as a solemnity, in November is a puzzle to historians. The Anglo-Saxon theologian Alcuin observed the feast on November 1 in 800, as did his friend Arno, Bishop of Salzburg. Rome finally adopted that date in the ninth century. Today the Church celebrates the feast of Sts. Simon and Jude whose names occur together in the Canon of the Mass and are also celebrated on the same day. Possibly this is because they both preached the Gospel in Mesopotamia and Persia where it is said they had both been sent, but in actual fact we know nothing for certain about them beyond what is told us of their being called as Apostles in the New Testament. 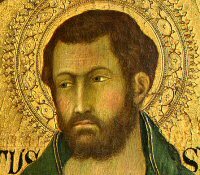 St. Jude is the author of a short Epistle which forms part of the New Testament. The churches of St. Peter in Rome and Saint-Sernin at Toulouse dispute the honor of possessing the greater part of their holy remains. —Excerpted from The Liturgical Year, Abbot Gueranger O.S.B. In 1925, Pope Pius XI established the last Sunday in October as the Feast of Christ the King. He did so in order to remind people of Christ’s everlasting authority over the people of the earth, thereby signaling the church’s resistance to the rising tide of secular values and ideas in politics as well as in social matters. This Roman Catholic feast day was adopted by the Episcopal Church as well as other churches of the Anglican Communion. ALMIGHTY and everlasting God, who didst will to restore all things in thy well-beloved Son, the King of kings and Lord of lords: Mercifully grant that all the kindreds of the earth, set free from the captivity of sin, may be brought under his most gracious dominion; who liveth and reigneth with thee and the Holy Spirit ever, one God, world without end. Amen. WE give thanks to the Father, who has qualified us to share in the inheritance of the saints in light. He has delivered us from the dominion of darkness and transferred us to the kingdom of his beloved Son, in whom we have redemption, the forgiveness of sins. He is the image of the invisible God, the first-born of all creation; for in him all things were created, in heaven and on earth, visible and invisible, whether thrones or dominions or principalities or authorities – all things were created through him and for him. He is before all things, and in him all things hold together. He is the head of the body, the church; he is the beginning, the first-born from the dead, that in everything he might be preeminent. For in him all the fullness of God was pleased to dwell, and through him to reconcile all things to himself, whether things on earth or things in heaven, having made peace by the blood of his cross. THEN Pilate entered into the judgment hall again, and called Jesus, and said unto him, Art thou the King of the Jews? Jesus answered him, Sayest thou this thing of thyself, or did others tell it thee of me? Pilate answered, Am I a Jew? Thine own nation and the chief priests have delivered thee unto me: what hast thou done? Jesus answered, My kingdom is not of this world: if my kingdom were of this world, then would my servants fight, that I should not be delivered to the Jews: but now is my kingdom not from hence. Pilate therefore said unto him, Art thou a king then? Jesus answered, Thou sayest that I am a king. To this end was I born, and for this cause came I into the world, that I should bear witness unto truth. Everyone that is of the truth heareth my voice. The Propers are those written in the 1928 Book of Common Prayer, the 1963 Book of Lesser Feasts and Fasts, and the American Missal. Luke, a physician from Antioch, was the only evangelist who was not a Jew. He never saw Jesus actually, but according to speculation, may have associated with the pagans who were with Jews of the Dispersion, going to the synagogue on the Sabbath with them. Or maybe he converted about 42 A.D. when Paul and Barnabus visited Antioch to preach. St. Luke was author of the Acts of the Apostles, and of the 3rd Gospel. He preserved the familiar parables of the lost sheep, the prodigal son, the Pharisee and the Publican and Lazarus. Nothing is known of the end of Luke’s life or when he died. Revelation 12:7 describes a war in heaven between Michael and his angels and Satan. Satan, known as the devil, was thrown to the earth. In apocryphal literature in Palestine and among Jews of the Diaspora, Michael the archangel was a special protector of Israel. 90 AD literature portrays Michael as an interceder for the human race and for recording the deeds of men in the heavenly books. Gabriel, Raphael and Michael are the three archangels mentioned by name in Scripture, but the prayers of the mass thank God for all good angels as they minister to us and aid us in worshipping and praising God. We may appeal to them for help. Early on, Constantinople had many temples where Michael was worshipped. This festival for him has been kept since the 6th century. The most famous remaining site in honor of Michael is Mont St. Michel—a medieval castle nearly offshore between Normandy and Brittany in France. This was begun in 1071 as a Benedictine monastery, built on top of an early church for Michael built in 709. Tax collectors in those days were social outcasts. Devout Jews avoided them because they were usually dishonest (the job carried no salary, and they were expected to make their profits by cheating the people from whom they collected taxes). Patriotic and nationalistic Jews hated them because they were agents of the Roman government, the conquerors, and hated them with a double hatred if (like Matthew) they were Jews, because they had gone over to the enemy, had betrayed their own people for money. Thus, throughout the Gospels, we find tax collectors (publicans) mentioned as a stadard type of sinful and despised outcast. Matthew brought many of his former associates to meet Jesus, and social outcasts in general were shown that the love of Jesus extended even to them. Of Matthew’s life after Pentecost the Scriptures tell us nothing. Later accounts of his life vary, some reporting that he was martyred, others that he died a natural death. The Christian community since early times has commemorated him as a martyr. Whether the Apostle Matthew is also the Evangelist Matthew — that is, whether the Apostle Matthew wrote the Gospel that bears his name — is disputed. The Gospel itself does not say who wrote it, but the designation “according to Matthew” is very old. In favor of his authorship it may be noted that (1) while Mark and Luke give the fourth pair of Apostles as “Matthew and Thomas,” the Gospel of Matthew gives them as “Thomas and Matthew”; and (2) while Luke 5:29 explicitly states, and Mark 2:15 suggests, that Matthew gave a banquet for Jesus, Matthew 9:10 in describing the same banquet does not indicate who the host was. Both of these variations would be routine touches of modesty if Matthew was the author. Perhaps the Gospel was written by some early Christian, not an apostle, whose name was Matthew, and about whom nothing else is known. Early Christian readers, hearing the Gospel ascribed to “Matthew,” would naturally associate it with the Apostle of that name, and so the ascribing of the work to the Apostle Matthew becomes common at an early date, by a perfectly natural misunderstanding. Papias of Hierapolis, writing in the late first or early second century, says that Matthew compiled the sayings (Logia) of Jesus in Hebrew. Now the material common to Matthew and Luke, but not to Mark, includes sayings of Jesus but almost no narrative. It has therefore been conjectured that there was once a document (usually called Q), now lost, that is basically a collection of speeches by Jesus, and that Matthew (the evangelist) and Luke had access to it while Mark did not. It has been suggested that Matthew (the apostle) is the author of this document Q, which may well have been first written in Hebrew (or Aramaic). The Scripture readings associated with the day bear the themes of Matthew as a Gospel-writer (hence readings that speak of the Scriptures), Matthew as an Apostle, and Matthew as a sinner called by God’s grace. We thank thee, heavenly Father, for the witness of thine Apostle and evangelist Matthew to the Gospel of thy Son our Savior; and we pray that, after his example, we may with ready wills and hearts obey the calling of our Lord to follow him; through Jesus Christ our Lord, who liveth and reigneth with thee and the Holy Spirit, one God, now and for ever. We thank thee, heavenly Father, for the witness of your apostle And evangelist Matthew to the Gospel of your Son our Savior; and we pray that, after his example, we may with ready wills and hearts obey the calling of our Lord to follow him; through Jesus Christ our Lord, who lives and reigns with you and the Holy Spirit, one God, now and for ever.